When the weather turns frosty, your first thought may be to turn up the heat indoors so that you are nice and toasty warm. Unfortunately, when you need to stay warm during the winter, it often leads to a higher utility bill. For this reason, many people try to keep the temperature on their heating system as low as possible in an attempt to lower their bill. In today’s post, we will give you a few ideas of creative ways that you can stay warm this winter while saving money. One easy way to save money on your utility bill is to schedule an inspection for your heating system to ensure that it is functioning properly and efficiently. If it’s been more than 10 years since you’ve replaced your heater, it could be adding to the cost of your utility bill. Luckily, if you live in New Jersey, our expert HVAC contractors are more than happy to provide you with the HVAC services that you need. We offer assistance with anything from installation to routine maintenance, and our talented experts are here to help you in any way that we can. Don’t wait until it’s too late. Contact our team to schedule an appointment for your heating system today! Once the temperature starts to drop, take it as a sign that it’s time to bring out the blankets. Blankets are a great way to add warmth to your body without having to raise the temperature. For example, if you’re sitting in your living room watching TV or reading a good book and you start to feel cold, instead of raising the temperature, throw on a blanket or an extra layer. Blankets are the perfect solution if you’re lounging around your home, and if you find yourself getting chilly at night, you can always throw one or two blankets on top of your covers as well! If you’re trying to lower the cost of heating your home this winter, you may be under the impression that using a space heater will have the opposite effect on your heating bill. However, lowering the overall temperature on your thermostat and compensating with a space heater will actually help you stay warm without using as much energy. If you think about it, a space heater is a very small appliance compared to your heating system. Lowering the temperature of your home and using space heaters in the main living areas will help you and your family stay warm and may even help you save some money. That being said, if you choose to use a space heater, make sure it is at least three feet away from any flammable objects. 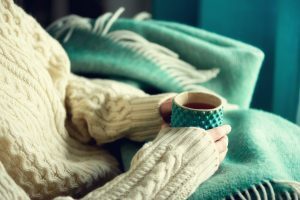 When you’re cold, it can be extremely tempting to give in and turn up the temperature on your thermostat, but if you are determined to save money this winter, it may be a better idea to first try and warm your body. When you’re trying to stay warm during the winter, it’s much easier to warm up your body as opposed to warming up your home. Try drinking hot liquids or snuggling under a blanket. If you’re still feeling cold, try and cover up the areas on your body where you might be losing heat such as your head and your feet. Heat can escape from any part of your body that isn’t covered by clothing, and most people don’t walk around their homes wearing slippers or hats. That being said, if you’re feeling particularly chilled and you want to avoid turning up the heat as much as possible, putting on a hat and donning your favorite slippers or fuzzy socks may give you the extra warmth that you need. If you’re lucky enough to have a working fireplace in your home, use it! Fireplaces are one of the best ways to keep at least one room in your home warm without having to raise the temperature on your thermostat. The crackling of the wood as it burns, the comforting smoky smell, and the warmth will not only make you feel toasty inside your home, but they also add a homey and comforting vibe to the room. All of that being said, if you do decide to use your fireplace, make sure you take all of the necessary safety precautions. It’s no secret that older windows without proper insulation may be the cause of a chilly home, and if that is the case in your house, you may be tempted to leave your curtains closed to prevent as much of the cold air from entering your house as possible. While thick curtains are a great way to trap the cold, they shouldn’t be closed all day. When the sun is shining outside during the day, it’s better to open up your curtains and use the sun’s warmth to heat your home. Then, once the sun begins to set, you can close the curtains to keep the warm air inside and trap the cold air by the windows. There are many ways you can save money this winter without sacrificing your comfort in your home. In addition to all of the tips listed above, you can also schedule a routine maintenance check with the experts at our HVAC company. We offer a variety of HVAC services for residents in New Jersey, and we would be more than happy to provide you with routine maintenance to ensure that your heating system is functioning properly. Give us a call today if you have any questions or you would like to schedule an inspection.